Valley this eleventh day of June, in the year one thousand eight hundred and fifty-five by and between Isaac I. Stevens, governor and superintendent of Indian affairs for the Territory of Washington and Joel Palmer, superintendent of Indian affairs for Oregon Territory on the part of the United States, and the undersigned chiefs, headmen, and delegates of the Nez Perce tribe of Indians occupying lands lying partly in Oregon and partly in Washington Territories, between the Cascade and Bitter Root Mountains, on behalf of, and acting for said tribe, and being duly authorized thereto by them, it being understood that Superintendent Isaac I. Stevens assumes to treat only with those of the above-named tribe of Indians residing within the Territory of Washington, and Superintendent Palmer with those residing exclusively in Oregon Territory. The said Nez Perce tribe of Indians hereby cede, relinquish and convey to the United States all their right, title, and interest in and to the country occupied or claimed by them, bounded and described as follows, to wit: Commencing at the source of the Wo-na-ne-she or southern tributary of the Palouse River; thence down that river to the main Palouse; thence in a southerly direction to the Snake River,at the mouth of the Tucanon River; thence up the Tucanon to its source in the Blue Mountains; thence southerly along the ridge of the Blue Mountains; thence to a point on Grand Ronde River, midway between Grand Ronde and the mouth of the Woll-low-how River; thence along the divide between the waters of the Woll-low-how and Powder River; thence to the crossing of Snake River, at the mouth of Powder River; thence to the Salmon River, fifty miles above the place known [as] the ” crossing of the Salmon River;” thence due north to the summit of the Bitter Root Mountains; thence along the crest of the Bitter Root Mountains to the place of beginning. 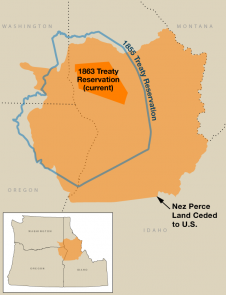 The 1855 treaty established a 7.5 million acre reservation, but before the treaty was even ratified, mass trespass driven by gold discoveries throughout the region resulted in boom towns and violence between the Nez Perce and whites. 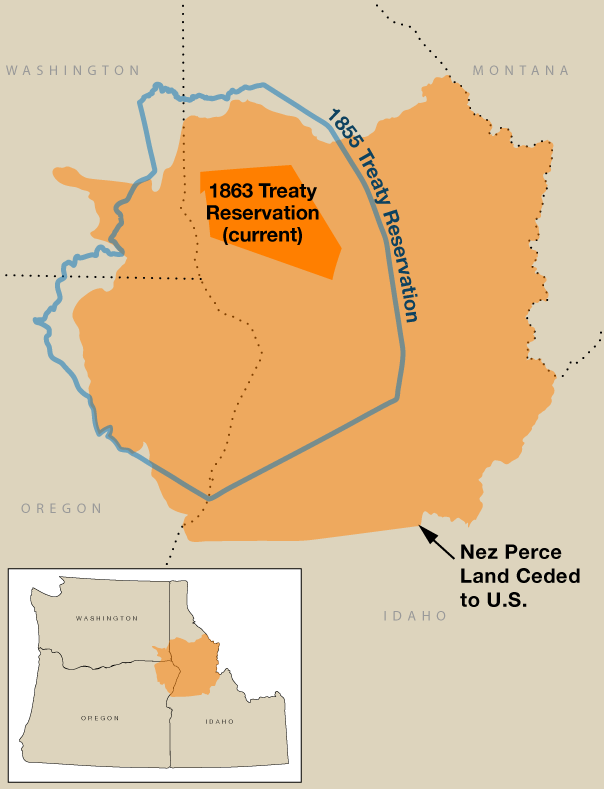 The Nez Perce appealed to Congress to honor the terms of the treaty, and in response, the federal government reduced the size of the 1855 reservation by 90%. White immigrants demanded that the government move, forcibly if required, all Nez Perce living outside the new reservation boundaries onto the new reservation. Chief Joseph and his band in the Wallowa Valley refused, precipitating the Nez Perce War of 1877. The present Nez Perce reservation is 770,000 acres. The United States further agree to establish, at suitable points within said reservation, within one year after the ratification hereof, two schools, erecting the necessary buildings, keeping the same in repair, and providing them with furniture, books, and stationery, one of which shall be an agricultural and industrial school, to be located at the agency, and to be free to the children of said tribe, and to employ one superintendent of teaching and two teachers; to build two blacksmiths’ shops, to one of which shall be attached a tinshop and to the other a gunsmith’s shop; one carpenter’s shop, one wagon and plough maker’s shop, and to keep the same in repair, and furnished with the necessary tools; to employ one superintendent of farming and two farmers, two blacksmiths, one tinner, one gunsmith, one carpenter, one wagon and plough maker, for the instruction of the Indians in trades, and to assist them in the same; to erect one saw-mill and one flouring-mill, keeping the same in repair, and furnished with the necessary tools and fixtures, and to employ two millers; to erect a hospital, keeping the same in repair, and provided with the necessary medicines and furniture, and to employ a physician; and to erect, keep in repair, and provide with the necessary furniture the buildings required for the accommodation of the said employees. The said buildings and establishments to be maintained and kept in repair as aforesaid, and the employees to be kept in service for the period of twenty years. Isaac I. Stevens, [L. S.] Governor and Superintendent of Washington Territory. Joel Palmer, [L. S.] Superintendent Indian Affairs. Toh-toh-molewit, his x mark. [L. S.
James Doty, secretary of treaties, W.T. Wm. 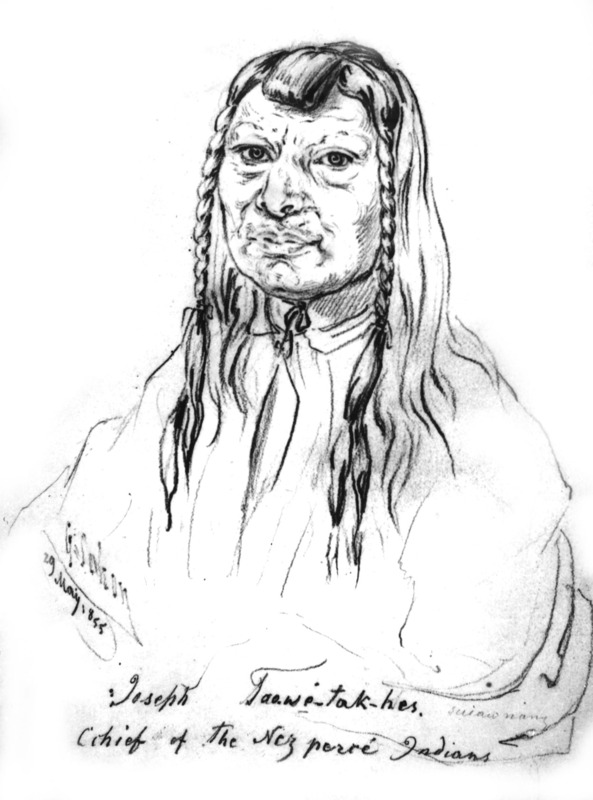 C. McKay, secretary of treaties, O.T. You must stop your ears whenever you are asked to sign a treaty selling your home. A few years more, and white men will be all around you. They have their eyes on this land. My son, never forget my dying words. This country holds your father's body. Never sell the bones of your father and your mother. —Nez Perce Chief Old Joseph, to his son Chief Joseph.